My name is Rocky, and I'm the Past Purr-fect's official greeter. 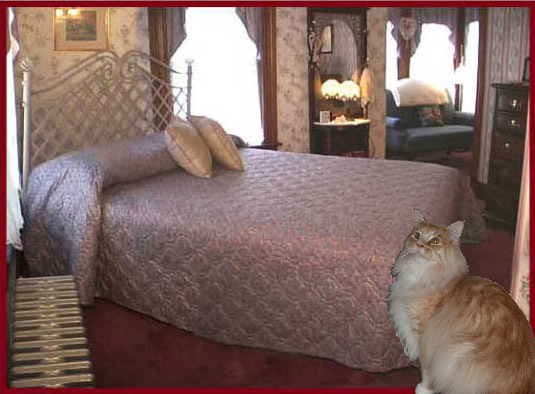 Come with me and I'll show you some of my favorite places at the Past Purr-fect Bed and Breakfast. 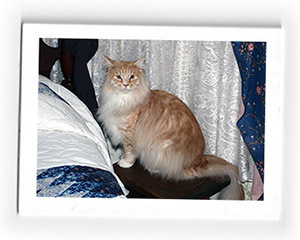 "Click" on any of the photos to see a larger image. Living Room: The beauty and intricate craftsmanship in these two rooms are reflected in the oak archways with pillars. Our living room has generous seating and is a terrific place to gather. This room represents true Victorian flavor in design. Belgium rugs enhance the hardwood oak floors that are from the turn of the century. The room is furnished in custom covered traditional furniture. The large oak trim windows make this room warm, radiant, and sunny. Sitting Room: Our sitting room offers a full outside view. The exterior wall is all windows with the original leaded glass frames hanging inside to give this room a unique design. Relax on the Victorian furniture and enjoy the television. The sitting room is a bright and pleasing area. 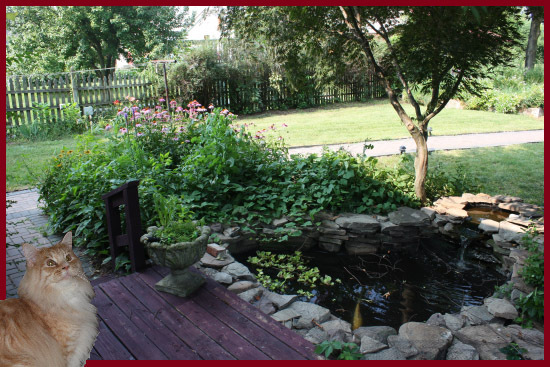 Screened-in Porch and Koi Pond: During the warmer months our guest enjoy reading, relaxing, and a scrumptious breakfast in our large screened-in porch, Our porch offers comfortable wicker furniture and the tranquil effect of our pond. The Breakfast Room: Breakfast at my B&B is our favorite time of the day. From what I can tell it seems to be pretty popular with the humans too. 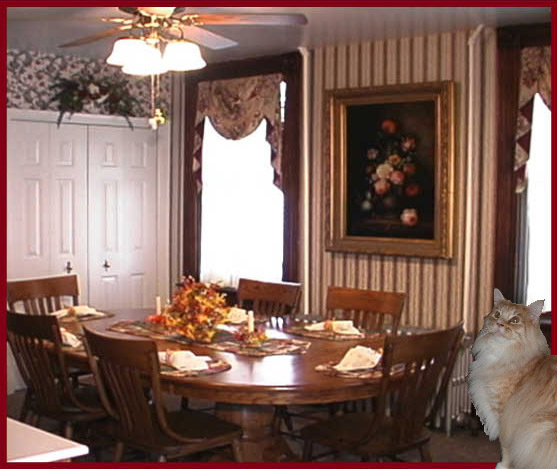 Served in our wonderfully warm oak dining room, breakfast at the Past Purr-Fect B&B is a filling experience. Our sumptuous breakfast features all the best of our tender loving care. Start your day with a tantalizing assortment of fresh fruits, scrumptious fresh baked goods, tempting entrees and specially prepared juices. Plenty of hot coffee (decaf or regular) or tea (plain or herbal). We absolutely hope our guest relax in this heavenly sanctuary. Our dining room accommodates up to ten guests. Sample Menu: fruit with special topping, coffee cake, ham and egg strata, bagels with cream cheese and jam, tropical juice, and hot coffee. Refreshments: We keep a fully stocked mini refrigerator in our guest dining room that is open to everyone. Himalayan ($75.00 per night): Nestled in the back of the house this room with its' oak furnishings offers a quiet resting oasis. The comfortable queen size bed allows plenty of relaxing space. The private bath adds to a secluded weekend getaway. Tabby ($70.00 per night): With its' large windows the sun peers through this room in the morning hours. Relax in the seating area with the warmth of the sun upon your face. The custom queen size bedding sweetens your dreams. The half bath in the room allows you semi-privacy. if you savor the sunshine, this room is for you. 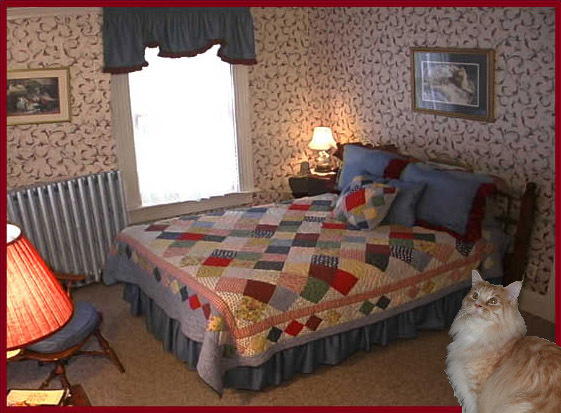 Calico ($65.00 per night): Traveling with a companion? This bright, cheery, spacious room offers twin beds. 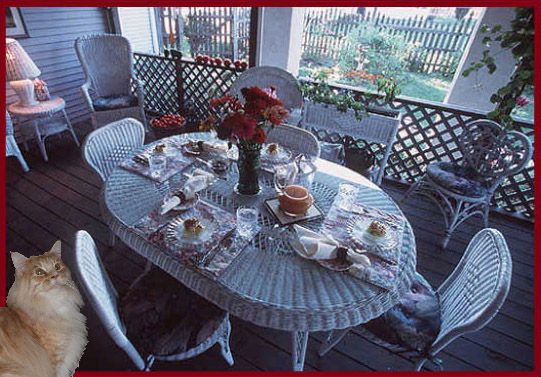 The cozy wicker furnishings offer a warm welcome to weary travelers. This room shares a bath, but has a full sink area. Ragdoll (60.00 per night): At the top of the stairs lies a colorful, snug room with a double bed. 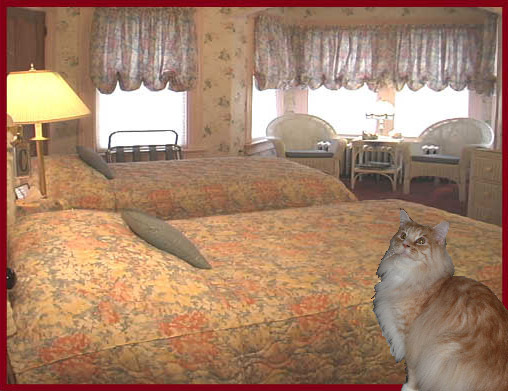 Although this is the smallest of our rooms, it is purr-fect for the lone traveler. This room shares a bath, but has a full sink area. All of our bedrooms are fully carpeted. 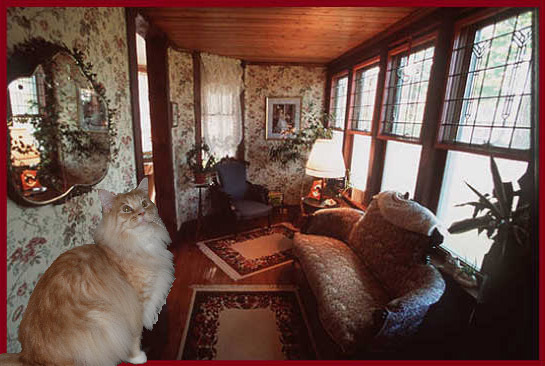 The Himalayan and Ragdoll rooms can each accommodate individuals or can be doubled with adjoining doorway, into suites. 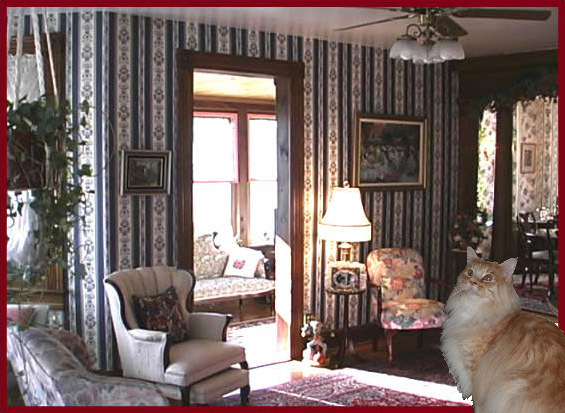 The Tabby and Calico rooms can each accommodate individuals or can be doubled with adjoining doorway, into suites for a family. 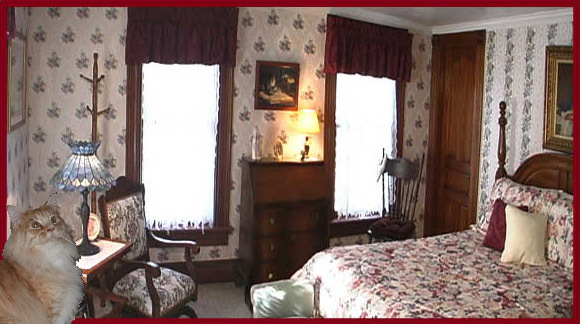 Our credo for our B & B is clean, cozy, and comfortable. Please click here to see our policies and for information about reservations.